This awesome resume template has such a wide range of uses due to its high quality design, it can be used for a job in most any industry. For a more pronounced appearance you can choose a brighter color for the top header. For a more conservative style choose subdued colors, for example a light gray for the header and black or dark gray for the words. Your name being so large really stands out and your address and other contact information are readily found on the top right. Putting this information inside the header keeps it all together in the same place. The rest of the sections below your name are clearly defined and can be effortlessly arranged to be in any order you need. The section labels are on the far left. The first company and the first school are each placed inline with the section label for those sections. The other sections also have the details inline with the label. This keeps the template more compact and orderly, you will be able to fit several more lines of facts while still maintaining the same page length. We have other styles that are similar to this high quality design that may be more suited to your industry. If you complete your resume using our creator you can circle back to the Styles pages to try every one of templates with all of your resume information plugged into them. If you don't like the one you've selected it's no problem, advance to the next one you are bound to find many others that will be a great fit! 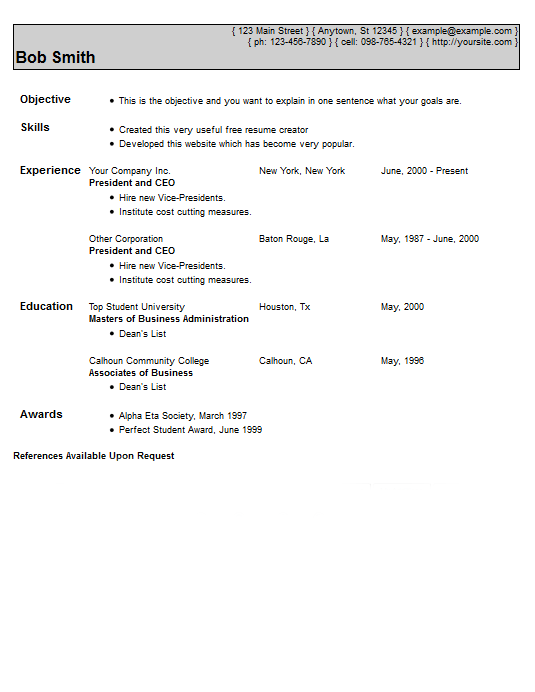 When you find your favorite style export it from the Preview page and you will have your free, fully functional resume.